Welcome to the spotters page. This page is for spotters to share information, locations and photographs with the world. Our readers come from all over the world as well as across Scotland and I appreciate the contributions made by enthusiasts who do not fly as much as I do those of pilots. I know for certain that many spotters know more about aircraft movements than many company employees and that the collective knowledge of our fenceline friends is truly vast. The standard and quality of many of the photographs are also truly outstanding. It is my sincere hope that many of you will share your talents, knowledge and photographs for others to enjoy. I will never sell your photographs but if you leave your contact details I'll be happy to put interested parties in touch with you. When you contribute to this site you will have your own page which you can share with your friends. You will receive updates whenever someone comments on your submissions or reply to comments you have made. Here is an example. I know there are professional photographers out there who are also spotters and who will have some excellent quality photos and prints for sale. This is an invitation to you to showcase your work free of charge to well over 3000 visitors every month from around the world. This invitation will not last forever but once you are on the site your page will remain free for you to use. 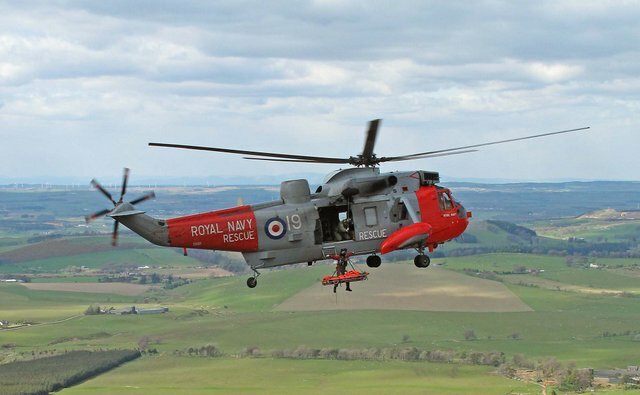 This photo of a Royal Navy Sea King at Tinto Hill comes courtesy of Lanarkshire and Lothians Soaring Club. Location, location, location for spotters. Local knowledge goes a long way and knowing how to get to the best spots can make all the difference to a picture. It may well be that you like to relax in a warm cafe, which you can do at Cumbernauld, or you might prefer hiking up a hill to get an almost air to air view like you can at Oban. Please respect privacy and property where access is limited. There is a great spot at the end of runway 23 at Glasgow. You can park on the Greenock Road in the lay by and get some great shots of aircraft on Finals. If you walk back towards the swing bridge you will see the access road to the cemetary on the right which allows a view along the runway. Bear in mind the airport police are nervous about intruders so be careful of how far you go. At the other end on approach to 05, there is a small access road to a farm off Barnsford Road. Again be careful not to block access as the road is in constant use. There are a few places to park along Abbotsinch Road which affords a good view of the runway but the police and airport security will move you on if you park at the crash gates. Whatever you do , don't leave your car unattended there or it will be removed at your expense. Airbus A380 from the lay by at Greenock Rd. One of the best places to go at Edinburgh is the end of Turnhouse Road. 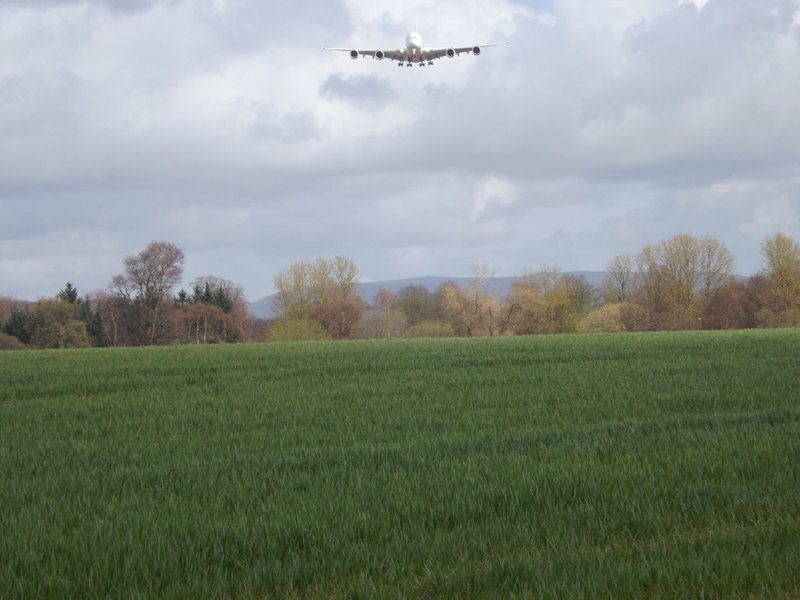 You can then move along Cammo Road and there is a track along the east side of the Railway embankment which affords a great view of aircraft on finals. The embankment blocks a view of the airport and it is both dangerous and illegal to climb up it. If you follow the track to the end there is an underpass where you can get a view of the field. Got info to share about other places to go spotting?